This Saturday, Women & Theatre will present a new piece of devised theatre created as part of our current project Boys Talk. The production, staged in mac birmingham’s Outdoor Arena, will be an engaging celebration of male communication utilising movement, drama and spoken word. Over the past few months we have worked with a talented group of adolescent males bringing together Looked After boys (via SWIIS Foster Care), boys who have experienced bereavement (via Edwards Trust) and boys from Elmhurst School for Dance. It’s been a busy Spring so far for Women & Theatre with performances of Clocking On (part of our WWI Women’s Work project), the beginning of our Boy’s Talk project and ongoing development of our research project, Hidden Harm in Dudley. Over the next few months we’ve got a number of great events planned and we thought we’d give you a quick low down so you don’t miss out! Last Sunday, Women & Theatre’s current Heritage project Women’s Work reached its culmination with the public performance of Clocking On performed at Small Heath Baptist Church. 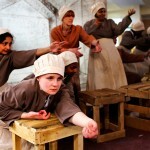 The piece, seen by over 100 audience members across two promenade performances, explored the role of female factory workers in the First World War addressing themes such as the independence of women and the effect of loss on community. The piece, drawn from research with the descendants of Birmingham factory workers, took in a number of real historical events such as the rise of the Suffragette movement and the first all women football team. To celebrate the launch of our new site we’re asking some of the people who’ve played a huge part in the work we do to speak about one aspect of the company they most admire. 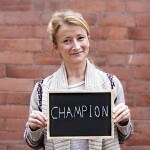 Alison Belbin has worked with W&T for over 15 years as a director, writer, actor and workshop facilitator. 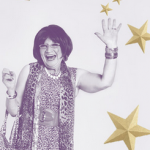 Alison has also worked for numerous other organisations that include Birmingham Repertory Theatre, The Hearth Centre, Foursight Theatre, Something & Nothing and the BBC. 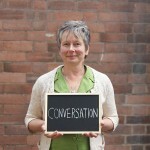 Alison has chosen the word ‘Conversation’ to represent the work we do and here’s a few words on why she chose it. 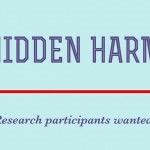 We are working with the Office of Public Health at Dudley MBC to carry out research about self harm. Our research process involves talking to and receiving emails from a wide range of people about their experiences and understanding of self harm. We would like to hear from people living and working in the borough of Dudley who have experiences or opinions relevant to our research. We’re very pleased at how our ‘Women’s Work’ project is developing and we thought we’d share some of the progress of the project so far. We’ve had some brilliant research sessions including a trip to the Library of Birmingham’s archive. We’ve also been privileged to hear the stories of locals and their descendants. In our first session we heard from New Zealand born Juliet Fletcher whose grandmother worked in a munitions factory in Longbridge and had a fascinating story to tell…. Women & Theatre has enjoyed a successful week of touring its new forum theatre production Taking Care of Helen to five Birmingham & Solihull Mental Health Foundation Trust settings. 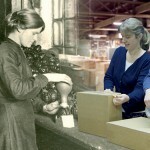 Women’s Work: Current heritage project is off to flying start! 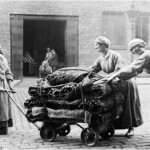 We’re very excited to be in the first phase of devising our new WWI heritage project ‘Women’s Work’. 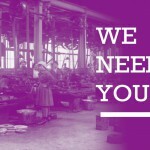 During February & March 2015, W&T artists are working with community participants to research the history of the BSA factory and the experiences of WWI female factory workers, before developing research findings into a theatre performance and exhibition.